Harman Kardon has published a preview page for its Microsoft Cortana powered smart home speaker. The perforated cylindrical 'Invoke' looks similar to the Amazon Echo device, aimed at a similar target market. The Harman Kardon Invoke will launch in autumn, coinciding with the release of Windows Redstone 3, notes Thurrott.com. In its promotional blurb for the upcoming smart home speaker, Harman Kardon writes "At the heart of Invoke is Cortana, your personal digital assistant, helping you stay on top of what’s important. Enhance every moment with captivating sound, voice control your music and smart home, make and receive hands-free calls with Skype, get answers to your questions, and more". Harman Kardon says its "beautifully designed speaker" provides detailed 360-degree sound projection. 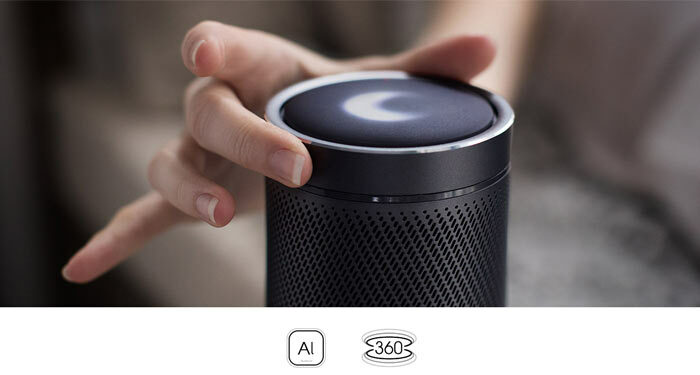 It is noted that you will need to have set up a Windows 10 PC or phone, or Android or iPhone, with the Cortana app to be able to make use of this AI speaker. Right now you might be wondering how well Cortana can do all your smart home tasks, or how it might compete against the Amazon Echo or Google Home smart speakers. Well, Microsoft is going to talk about Cortana next week at Build. Thurrott expects Microsoft to use the event to launch a "Cortana Skills Kit available to everyone". So the already smart and flexible Cortana will likely be able to expand her capabilities in the months running up to the Harman Kardon Invoke launch. Harman Kardon wants those interested in the Invoke to register for notifications. No pricing details have been shared so far. Are we witnessing the birth of an in-home AI arms race? Or did that already happen, with me asleep? More compatible devices, more functions available, better understanding of voices and languages. Moremoremoremore. How far have we actually come from original Siri anyway? Not very, although until the latest version of the Apple TV with the Siri handset, Siri wasn't really a stand alone device like Alexa. Microsoft are late to market again. A few years ago that wouldn't have mattered too much, often the late comers improve on the original concept. But the home automation aspects of a device like this depends on have I got applications to support it. Microsoft will either be relying on third party developers to do that, or they will do it in house. Judging by the way Windows phone is currently fading into obscurity because of lack of applications, who knows. On the other hand, this may fill a gap for those who are in the Microsoft ecosystem. I don't know about being late to the market so to speak, at least in the UK anyways as we've only just got google's option recently. I'd also say MS might have a good lead with cortana on windows 10, if anything amazon/apple are the ones which might have an issue long term although I suppose you could argue they do have their ‘fans’ lol. While I trust my info with MS more than google, apple and amazon I still wouldn't feel comfortable with them having a microphone in my house that is ‘always on’ and it's the reason I don't use one drive to store ‘personal’ info…. same reason that while I have a facebook account it's empty of any personal information. Also if MS follows with their current integration of their software with google and other cloud providers they could be a good option for those of us that have multiple providers for our webmail etc. Google is basically going to stick to google services, apple will likely stick with apple stuff, maybe add in some google/ms if you're lucky and amazon is basically hoping their ‘brand’ and cheaper pricing is strong enough to get a decent marketshare. Can Amazon sue them ?